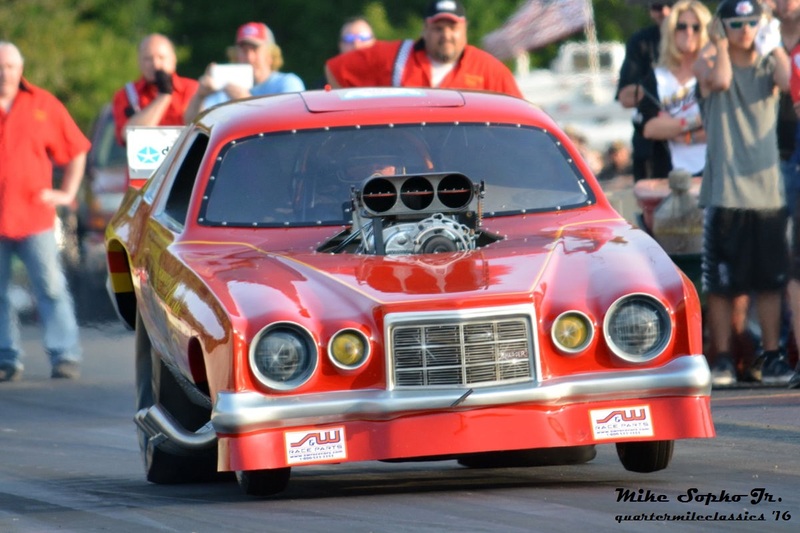 Text by Mike Sopko Jr. - Photos by Mike Sopko Sr. & Mike Sopko Jr.
Winters can be rough for drag racing fans. Winters in the Midwest can make it even worse for the drag racing enthusiast. Though this might not have been the worst winter when measured in meteorological terms the grasp of winter was still trying to hold on till the bitter end. 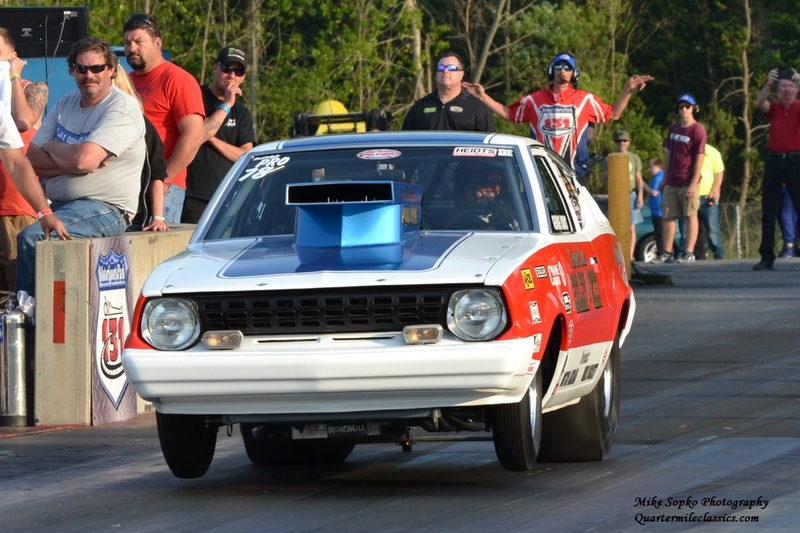 Case in point, just last week US 131 Motorsports Park in Martin, Michigan, hosted an import versus domestic battle which they completed only after the track had been dried of snow. Yes, snow in the middle of May! However, just a week later the sun was shining, temperatures were in the 70’s and the stage was set for the annual Super Chevy Night of Thunder that permanently shook off the cold from Old Man Winter. As usual the Petersons booked a smorgasbord of outstanding racing vehicles. On the menu were the Midwest Nostalgia Pro Stocks, Denny Salzwimmer’s Great Lakes Nostalgia Funny Car Circuit, John Lawson’s brand new “Runaway” Camaro against Nostalgia Drag World’s own Buddy Hull at the wheel of Tom Motry’s “Drastic Plastic,” the big show Top Fuelers of Dom Lagana and Kyle Wurtzel, Jim Brewer’s “Peacemaker” wheelstander, two nostalgia jet funny cars and last but certainly not least, the “King of Quake” himself Bob Motz. Bill Neri trying to rival the funnies for best burnout of the event! Several Nostalgia Pro Stocks made the trek to Martin, Michigan, including “Jungle” George Kubis in his “Billy the Kid” Plymouth Arrow, Mark Pappas in his Lee Shepard throwback Reher and Morrison Camaro, Mike Ruth in his 1978 Ford Fairmont Bob Glidden Tribute and Ted Peters in the “Patriot Missle” Duster. But after it was all said and done it was Bill Neri in the Warren Johnson tribute Camaro that made the best pass of the weekend with a 7.47 at 185.95 mph. The Great Lakes Nostalgia Funny Cars put on a show as only they know how with smoky burnouts, an occasional wheelie and side-by-side action. After the first round the cars came back out for a second pass, but the two quickest from the first round squared off for the bragging rights. The first pair up during round one was Jim Losci in the “Overload” Arrow versus John Kwasniewski in the “Pol Cal” Corvette. Losci launched hard carrying the right front wheel for the first 100 feet. Kwasniewski had to give up the ghost after experiencing some trouble. Losci crossed the traps at a 7.33 at only 153.11 mph to Kwasniewski’s 8.19 at 105.02 mph. Next up was Rocky Ausec in his “Solid Rock” Mustang against Bill Anderson’s “Roadshow” Camaro. Both Illinois natives laid down thick smoky patches of rubber. But when the ambers flashed Rocky’s Mustang pointed toward the sky and he was forced to lift after it made a move towards the guard wall, meanwhile Anderson laid down a mean 7.13 at over 186 mph. The last pair of the six had Mark Horvath in the “Gold Coast Charger” Cordoba against Nick Tilley in the “Shyster” Corvette. In the best match up of the first round both cars left together, but Horvath pulled away after the Vette of Tilley made an evil move towards the centerline. 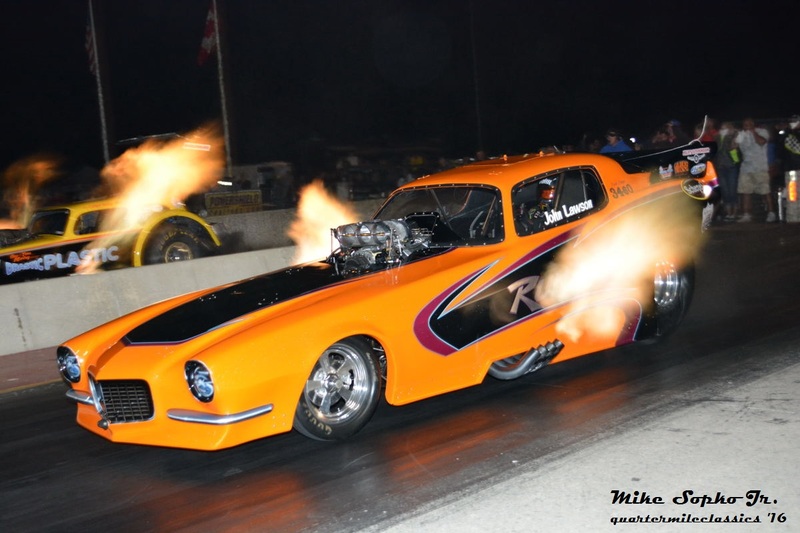 Horvath ran a stout 7.04 at 191 mph to Tilley’s 7.40 at 146. The second round began with the “Shyster” Corvette on a single that netted him a 7.89 at 156.74 mph. In the next pair Rocky Ausec was back behind the wheel of his evil mach one against the “Pol Cal” Vette of John Kwasniewski. 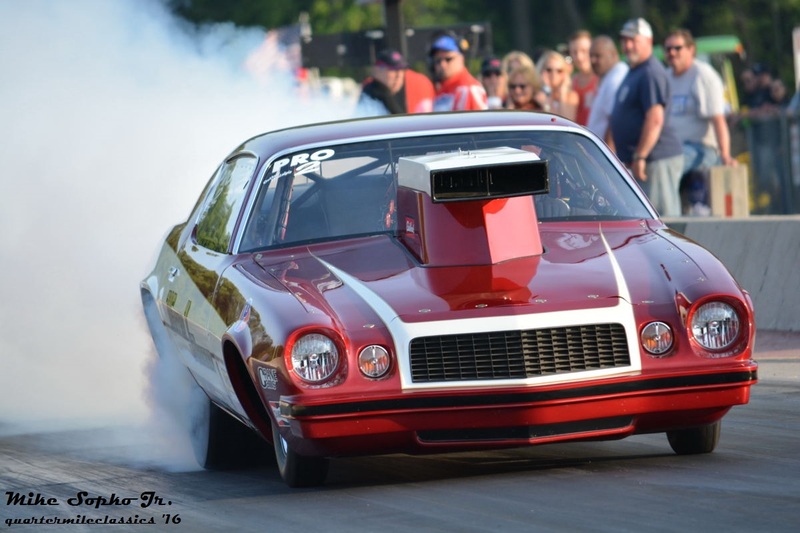 Rocky was still unable to shake the demons as his car motored down the track for a low 8 second pass while the “Pol Cal” Vette clipped the beams in just 7.19 seconds at over 182 mph. Last came the final pitting Horvath against Anderson for bragging rights and the trophy. Horvath again took low ET of the round posting a 7.17 at 182 mph to knock off Anderson’s 7.64 at 137. Hull and Lawson in the "Battle of Flames!" In the flopper versus altered battle Buddy Hull made his debut behind the wheel of Tom Motry’s “Drastic Plastic,” while John Lawson debuted a brand new nostalgia Camaro funny car still known as the “Runaway.” The sun was still high in the air as these two took to the track just after 7:00 pm. Both cars left together and each driver had their hands full, but at the stripe it was Lawson taking the first win with a 5.72 to Hull’s game 6.07. 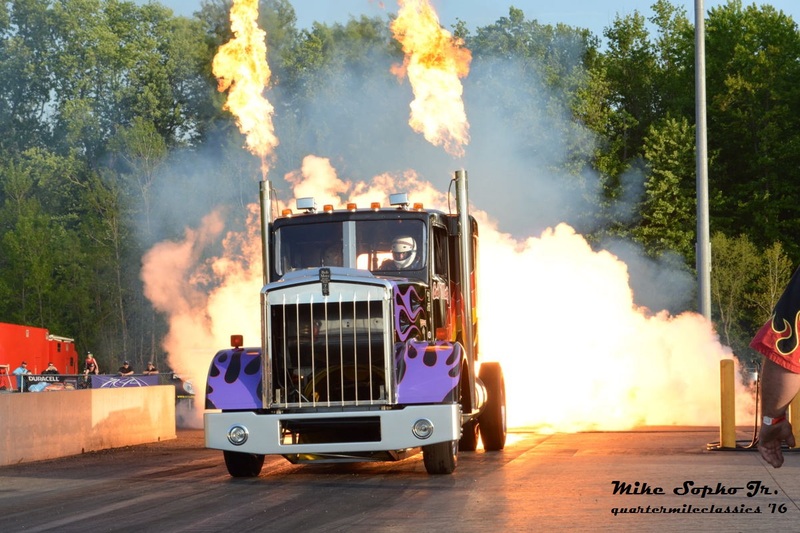 The last run would be done under the lights with both cars spitting flames that could rival that of any big show car. As the ambers flashed Lawson appeared to get a slight advantage. 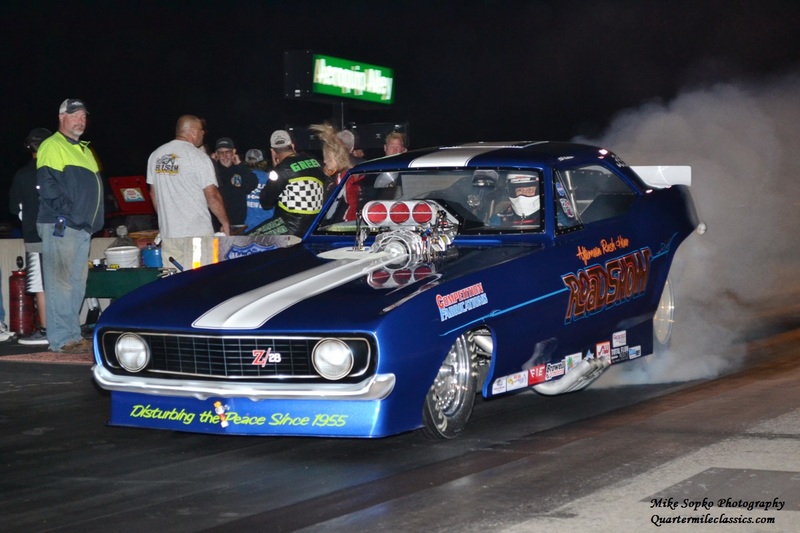 Both cars were haulin’ with the candles lit, but Hull’s “Drastic Plastic” went hunting for cones and crossed the centerline, meanwhile Lawson’s Camaro stayed hooked and true for an outstanding 5.40 at 273 mph. The "King of Quake" Bob Motz! That might not have been the most impressive performance, however, Bob Motz in his unmistakable semi thrust to an incredible 219 mph blast under the lights. 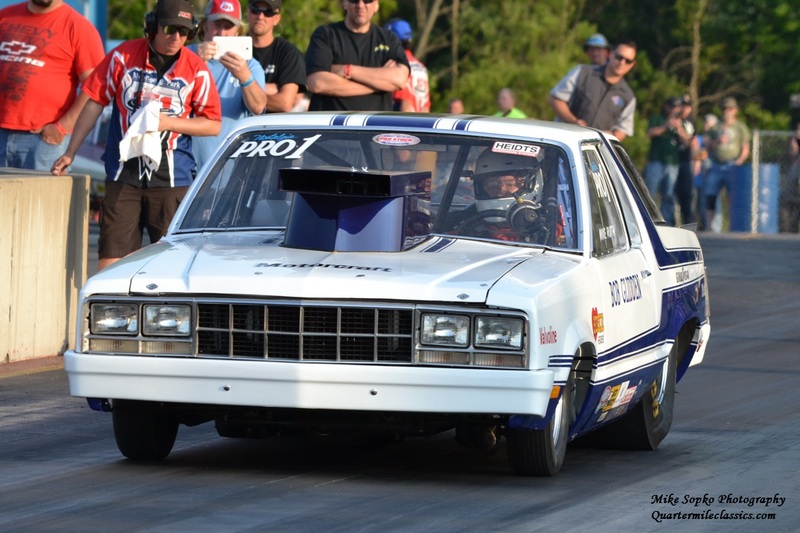 Thus another event goes down as a success for the wonderful US 131 Motorsports Park and kicks off their special events that will include the nostalgia funny cars of the IHRA in August and the annual Funny Car Nationals of September. If you are in the area mark it on the calendar and make it a point to attend these great events!